The Skinny: Johnnie To's gritty take on triad warfare is full of cinematic storytelling, deadpan absurdities, and disturbingly cool criminals. It's also a well-made kick in the teeth for a film industry that's been languishing for too long. Election does end on a shocking, though thematically appropriate downer, and a lot of minor developments seem to get introduced then promptly ignored. Still, this is as good as Hong Kong Cinema gets nowadays. Johnnie To still has it. The auteur makes a long-awaited return to Hong Kong cinemas with Election, a gritty take on the Hong Kong triad genre. Election details the decisions and consequences facing the Wo Sing Society, a storied Hong Kong triad that's looking to fill its Chairman role. In this corner: Big D (Tony Leung Ka-Fai), a charismatic, brash, and temperamental boss who attempts to bribe and bully his way into the Chairman's seat. 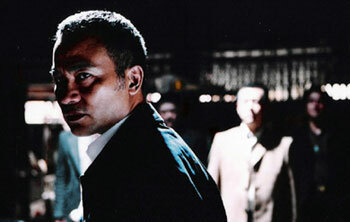 In the other corner: Lok (Simon Yam), a calm, collected, and cooly professional triad leader, who promises expansion and a steady guiding hand. Who will win, the tiger or the pussycat? And is either one really what they appear to be? And will Louis Koo fans be upset when they realize their tanned idol isn't in the film that much? The answer to all the above questions: who cares? This is a good Hong Kong movie, and that's about all that matters. The general story of Election is nothing to write home about. Basically, the Wo Sing Society needs a new chairperson, and it's down to Lok and Big D. Big D has already bribed a couple of the "Uncles", the senior triad members with all the political pull. He's hoping the money gets him in, but as Uncle Teng (Wong Tin-Lam) instructs the other Uncles, it's not the money that matters but unity. Teng favors the in-control Lok over loose cannon Big D, and at his urgings, the Uncles give in and elect Lok. However, Lok won't officially be the leader until he gains possession of the Dragon Head baton, a revered symbol of leadership that must be delivered to him. Smarting from his ignominious loss, Big D sets out to intercept the baton, whereupon every boss and small potato in the Wo Sing Society starts to get involved. If you secure the baton you'll either A) be a hero, or B) have plenty of pull. 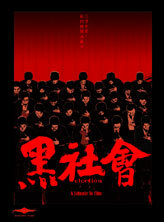 The incredibly-tanned Jimmy (Louis Koo) wants to get the baton to avenge his boss, who had the indignity of being locked in a wooden crate and shoved down a hill by Big D. However, various other lower-level triad dudes have been assigned to the case, including the overly-righteous Big Head (Lam Suet), his stuttering partner Soo (Eddie Cheung), fab maroon-shirted Kun (Gordon Lam), and the fanatically loyal - and possibly rabid - Jet (Nick Cheung). The cops (led by Shaw Brothers staple David Chiang) detain all the high-level players in hopes of stopping an all-out gang war, while the small potatoes run across the border and back in an effort to get the baton. Double-crosses and assorted triad hijinks ensue. Having multiple factions go after the baton leads to the expected run-ins, though the results are as funny as they are ironic and absurd. Basically, two guys go at it with their lives possibly at stake, but the bottom line is they're working for the same side. This is only discovered after some brutal violence, e.g. Kun smacking Big Head around with a massive log, or Jet getting multiple stab wounds from the omnipresent triad choppers (in an ultra-realistic move, Election features no gunplay at all). Jet and Jimmy seem initially opposed when jockeying for the baton, but end up on the same side when Big D's men engage Jet in a five-on-one standoff. These action scenes are staged with the slow-burn threat of violence and sudden jolts of brutality, and when they happen they're riveting. Unfortunately, there are very few of these action sequences. But actual visceral action is not what Election is about. All the action in Election takes place in negotiations between cops and triads, uncles and bosses, lawyers and bosses, and finally bosses and bosses. Johnnie To takes a deep, reportedly realistic look at the mechanics and rigid mores of a triad-run election (the Chinese title, "Hark Se Wui", means "The Black Society", and is Cantonese for "triad"). This sounds like it could be all sorts of boring, but To does more than have his characters sit around smoky tables endlessly debating "face". Election moves along fairly quickly thanks to spare exposition, sharply-defined character types, shifting locations, and crosscutting action - and does so efficiently enough that the educational aspects of the film get swallowed incredibly easily. In many ways Election works as a triad election tutorial, i.e. this is how you should act (like Lok), and this is how you shouldn't act (like Big D). If you break the rules of the triad, you get threatened with assassination, and if you're too ambitious, you'd better watch your back. To portrays the triad society as a rigidly-structured, almost fanatical group, and while his storytelling is sometimes obvious, the overall feel is immediate and seemingly real enough to involve. To also allows his actors to create more than just types. Tony Leung Ka-Fai is hyperactive and a bit cartoony as Big D, but the actor is able to imbue the character with palpable fear, self-doubt, and blind ambition - sometimes simultaneously. Yam is cool and charismatic as Lok, and yet reveals a cold, calculating face beneath his smiling politician's mask. The other actors have less to work with, particularly Louis Koo, who only seems to get third billing because he's the most popular star in the film. Koo gets the pivotal role of the younger triad who's loyal, but quietly questions the rules and hierarchy of the organization. When we first meet him, he's attending a university lecture, yet another nod by To to the inherent realities of the triad "business". The powerful bosses talk about making money and keeping jobs, and those who are too concerned with pride and "face" might as well paint a target on their backs. The winners are the ones who preach loyalty to the triad, and make the tough decisions to keep everyone happy. That is, until the ending, which shows that sometimes cold-hearted smarts and ruthlessness can get the job done, too. Election ends on a thematically appropriate, but disturbing and nihilistic note that takes any notion of honor and throws it to the wind. Triads might preach righteousness, but in the end it's just another way to play the game. Election is sort of an oddity; it's a movie that takes great pains to reveal supposedly realistic triad rituals, and yet it can still find time for righteous grandstanding AND a final moment that basically shouts, "the triad is full of bad, bad people." Well, it is full of bad, bad people, which is why Election may likely piss off moviegoers who are used to some sort of redemption in their films. The characters are cold-hearted, justice and remorse are noticeably absent, and the violence is shocking in its ugly brutality. Killing someone in Election requires repeated bludgeoning with a heavy object, and after the fifth or sixth whack there's simply nothing glamorous about it. Those who like an extra dash of righteous heroism in their triad movies may be put out. Notes:  Rumors of a three-hour version of Election are as yet confirmed. Reportedly, Johnnie To shot a lot more than could be shown in 99 minutes (the film's current running time), and some advertised cast members - like To favorite Cherrie Ying - didn't make the final cut.  In a slightly related note, a sequel to Election is already in the works. Louis Koo will return.